Welcome to a unique residential community with a beautiful and private 305 acre lake connected by channels winding throughout the neighborhood. Homeowners enjoy private homes in a year-round vacation-like setting. Rich in history, the community began as Aurora Lake Park with camping, swimming and fishing and has developed into a neighborhood of 887 homes. 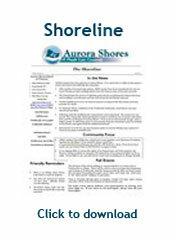 Aurora Shores is located both in the City of Aurora and the Village of Reminderville where the children attend either Aurora City Schools or Twinsburg City Schools. • Proximity to the Metro Parks for hiking. In addition to the many amenities within Aurora Shores, our residents enjoy a wonderful sense of community where families are not just neighbors but lifelong friends. Please explore our website and see why Aurora Shores is a rare and wonderful place to live.